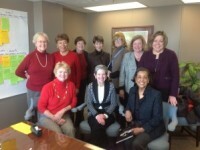 The 2013 Distinguished Daughters Planning Committee held its first meeting in February in the offices of The Foundation for Enhancing Communities in Harrisburg. Working with a facilitator, the group reviewed the status, purpose, strengths, challenges and core values of the organization and drafted recommendations for the membership to consider for next steps to assure that Distinguished Daughters remains vital and relevant. Committee members are: front row, left to right, Susan Catherwood, past president, Susan Belin, president, and Nancy Washington, past president; back row, left to right Jeanne Bovard, Cecile Springer, Joanne Denworth, Leslie Ann Miller, Jeanne Schmedlen, committee chair, Michelle Ridge and Martha Harris.